On this day in 1984, horror comedy classic Ghostbusters was released in U.S. theaters. Three decades later we’re still playing with toys based on the film. 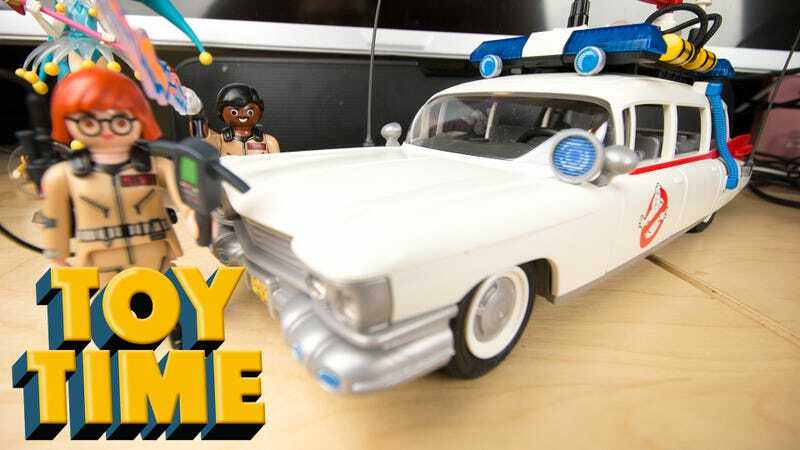 While the figures might look silly, Playmobil’s Ecto-1 is one of the coolest renditions of the Ghostbusters’ iconic ride yet. 2017 marks Playmobil’s first foray into licensed toys, after more than forty years of cranking out original building toys. The Ghostbusters line was revealed earlier this year at the New York Toy Fair, alongside some lovely How To Train Your Dragon sets. The Ghostbusters line is hitting store shelves now, and I got my hands on this sweet ride right here. Playmobile is not Lego or Mega Bloks, requiring hours of building and a whole lot of tiny bits. The Ecto-1 set here is 79 pieces, and I assembled the whole thing in about a half hour. How do you build an Ecto-1? Start with an almost completed shell, then add all the bits and stickers to the parts that don’t look like an Ecto-1 yet. It’s not nearly as daunting a task as it looks from this pile of parts and bags. The easy-to-understand instruction booklet is only 15 pages long. I will say that folks with big fingers looking to keep their sticker applications as accurate as possibly might want to use tweezers for placement. Note my skewed tail lights. I love the thick rubber wheels that come with the set. They give the vechile a bit of bounce, as if it had working shocks. The way the wheels tab in to the undercarriage is really nifty. From hoses to translucent red lamps on the fins, Playmobil’s Ecto-1 features a lot more detail than I would have expected. Here’s the electronic bit. It takes three AAA batteries. In exchange it produces lights and that unmistakable siren sound. I’ll drop a short video of it in action below. I would have been completely happy with the Ecto-1 as it is right here, but then came all the rest of the lights, tools and hoses. The majority of finer sticker work takes place up top, filling in the little details of the junk the Ghostbusters packed on top of that poor hearse. And when you press those buttons on top of the unit, this baby really sings. Of course it’s not all about the car. I mean, it’s mostly about the car, sure, but there’s also things like ghost traps. They even applied a sticker on the inside to represent the glowy netherworld energy prison into which supernatural entities are sucked. There’s even a little sticker for the PKE meter, expertly wielded here by Janine. For Playmobil people, Winston and Janine look mighty fine. Especially when they whip out those proton packs. The set almost comes with four pieces of translucent green rubber slime. Somehow I see this being used in places not related to Ghostbusters. I’m really pleased with how Playmobil’s Ecto-1 turned out. I’ve put together and played with many a version of this vehicle in my time, from original movie toys to more recent Lego kits, and this is by far the coolest. Now all I need is the massive Firehouse set, and my Ghostbusters itch will be completely scratched. Happy Ghostbusters Day, everybody!